During the first one-hundred-year history of Annapolis, only five black men would enter the United States Naval Academy between Reconstruction and the beginning of World War II (Schneller, 2005). None of these young people had a chance to graduate, the cards apparently bound not in their favor, experiencing mental and physical scars due to severe racial discrimination, ranging from brutal hazing incidents to the institutionalized racist policies of the Academy itself. The United States Naval Academy began operations in 1845 at Fort Severn, and the first superintendents were slave owners and mostly southern gentlemen (Schneller, 2005). This slave mindset for over a century prevented racial integration and so it took 104 years to get the first black graduate of the Naval Academy. Wesley A. Brown entered in 1945 and became the first African American graduate in 1949. America in 1946 was still a segregated nation. African American men were still subject to being lynched in the South. There were still restrictive tenants in place to prevent African Americans from owning a home in various neighborhoods and not just in the South. There were no black mayors in 1946. The possibility of actual Civil Rights in America was only possible because of the barrier-breaking accomplishments of achievements of Jackie Robinson, Don Newcombe, and Roy Campanella. These black sports professionals laid a path upon which Dr. Martin Luther King could forge a new pathway. Between 1949 and 1972 only a handful of Blacks would enter the Naval Academy and mostly because of football. It would take seven years after the passage of the Civil Rights Bill of 1965 to end segregation at the Naval Academy. 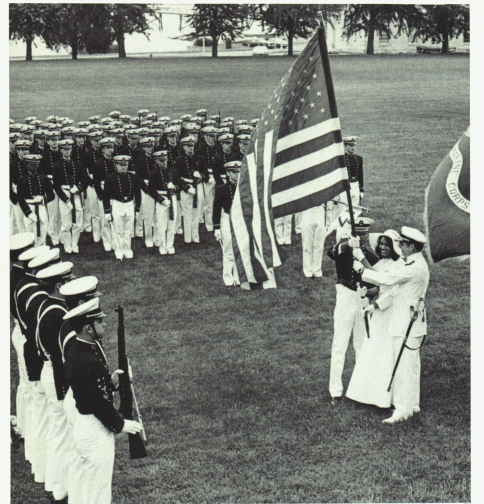 In 1972 many more would enter the Academy and could be seen throughout the 4,100 Midshipmen at Annapolis. This book is about one of the young African-American men (Dr. Jordan B. Smith, Jr.) who graduated from the Naval Academy in 1976 whose accomplishment ignites a communication frenzy among the media as another Navy tradition goes away. The cover picture above shows a black girl wearing a traditional southern bell formal white dress. The pictures of this event make public that Blacks could compete with their white counterparts and live in harmony. These black midshipmen pioneers of Annapolis brings an end to the racial discriminatory tolerant institutions of learning like the United States Naval Academy. The black midshipmen of the Class of 1976 would provide the pathway for other African-Americans to enter Annapolis without fear of racism. Montel William (1980), Napoleon McCallum (1986), and David Robinson (1987) are well-known names of African-American achievement. Very few know of the significance of the relationship between Wesley Brown and President Jimmy Carter. All of these men graduated from Annapolis. This book does not examine the black community's efforts to integrate the Naval Academy. It does include a personal perspective from the experience of a Black Midshipmen who was able to demonstrate his abilities without fear of discrimination, as well as the real experiences this African American midshipman encountered at Annapolis during 1972-1976. Historian Robert J. Schneller analyzed how the Academy responded to demands for integration from black and white civilians, civil rights activists, and politicians, as well as what life at the Academy was like for black midshipmen and the encounters they had with their white classmates (Schneller, 2007). During the twentieth century, the U.S. Naval Academy evolved from a racist institution to one that categorized equal opportunity among its traditional creeds. This transformation was not without its societal cost, however, and black midshipmen bore the impact of it. Dr. Smith's early life (1954-1972) was throughout the pivotal time during the history of integration in America. Dr. Smith was one of the few African Americans to enter the Naval Academy between the years 1972-1976. This book reveals how a few black men accomplishments laid the foundation to satisfy the outcry of the black community as a whole. Their notable accomplishments met civil rights advocates' demands for equal opportunity and shaped the Naval Academy's evolution away from a racist institution. "It would have been impossible to predict what would happen during the next four years. I will share with you an insider's look and description entirely different from the scenes in the movie “Annapolis.” Honestly, this film was nothing like being a midshipman at Annapolis since it focused only on the Brigade boxing championship. Being a midshipman at Annapolis for the majority of Black men in 1972-1976 presented many different challenges. Annapolis had its own philosophy, climate, and culture. Only after you’ve experienced the grueling rigors of Plebe Summer, and after you have faced the responsibility of leading other midshipmen and after you have thrown your hat into the air at graduation will you really know what the Naval Academy experience is all about. Make no mistake: my four years at Annapolis were very challenging, firmly structured, and designed to drive myself well beyond my perceived limits. I had lived in Saint Louis, Missouri my entire life. I had never been on a road trip out of Missouri, and the trip to Annapolis by car was an experience. So in June 1976 my dad, mom, and my brother drive to Annapolis. I did not know it at the time, but the person who was really scared was my mom, but I did not know exactly why till much later. Maybe she already knew the history of the Naval Academy and the fate of the first six African American men who entered the gates of Annapolis. Five of the six would leave after resigning for undisclosed reasons falsely noted as academically deficient and one would graduate after 105 years" (Smith, 2017). 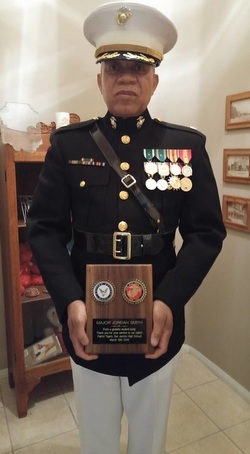 "I had never been to a military base before, and I got my first look at a United States Marine carrying a .45 caliber revolver as we approached the main gate. There were no salutes just a quick checking of driver’s license and a copy of my orders were viewed by the gate sentry. There were hundreds of people on the campus. The first thing I noticed that the campus was surrounded by water. I made no connection to the water and why swimming would determine how I spent my next six months due to an event scheduled for me the first day of training. When we got out of the car, there were escorts dressed in the white Navy uniforms. My dad loved everyone calling him “Sir.” In 1972 no African American was called "Sir" by someone who was white. These Navy Midshipmen seemed like a replica of the Stepford Wives Club” but in uniform. All the men in uniforms were built the same and wore their uniforms exactly the same way. My dad had traveled nearly 840 miles and 13 hours to deliver a $600 check for my uniforms. The rest of my education was paid for by the United States government and the sweat equity of my mind and body" (Smith, 2017). ​Dr. Jordan B. Smith, Jr. was born in Saint Louis, Missouri. He attended Lexington Elementary in Saint Louis, Missouri and graduated from Christian Brothers College Military Institute in 1972. He attended the United States Naval Academy during 1972-1976 and graduated earning a Bachelor of Science in Mathematics in 1976. He is a Marine Corps Veteran (Operation Desert Shield/ Desert Storm) achieving a final rank of Major. He earned his Masters of Arts in Education in Secondary Education in 2006 and his Doctor of Education in Educational Leadership with a specialization in Curriculum and Instruction from the University of Phoenix in 2015. He has been a public school teacher for 14 years and is presently a teacher in the San Jacinto Unified School District in California. Schneller, R. (2005). Breaking the Color Barrier: The U.S. Naval Academy's First Black Midshipmen and the Struggle for Racial Equality. New York, NY: NYU Press. Schneller, R. (2008). Blue & Gold and Black: Racial Integration at the United States Naval Academy. Williams-Ford, TX: Texas AM University Press. Smith Jr, Jordan B. (2017). Annapolis Creed: The First African-American Color Company Commander at the United States Naval Academy. Hemet, CA: Author.